Must be locally-convex. That is, the faces surrounding each vertex must loop around the vertex in the same direction (no retrograde faces spanning back the other way). All vertices must be vertices of the convex hull. This is to ensure that all vertices are visible, and is a condition always met by uniform polyhedra. 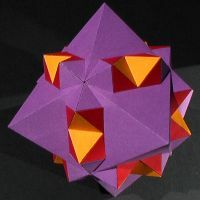 In the three icosahedral cases, the pentagons are augmented with pentagonal pyramids, in the other case the squares are augmented with square pyramids. Unfortunately, augmenting with cupolae failed to meet the conditions in all cases. More interesting new polyhedra could surely be created by changing my rules slightly. Since my initial investigation, Jim McNeill has taken this idea and run with it. He found many more polyhedra following these rules and variations on them. His results can be found at http://www.orchidpalms.com/polyhedra/uniform/augmented/augment.html.